Plastics – food for marine microbes? 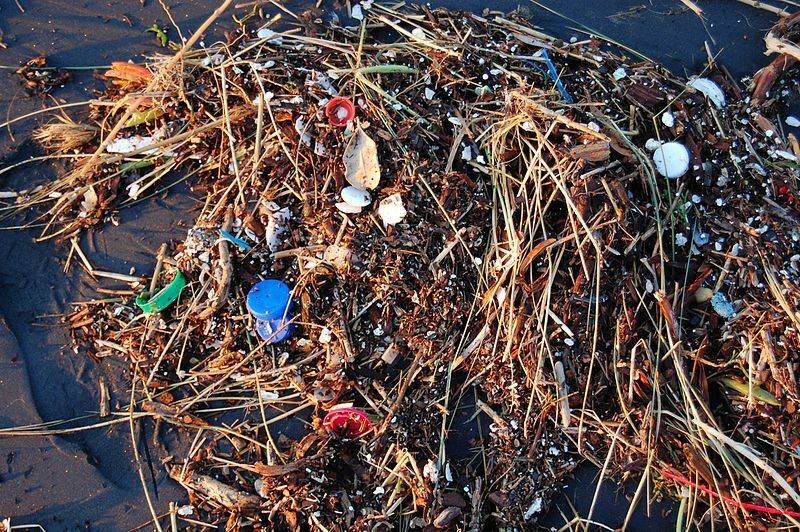 The ocean has a serious plastic problem. It is estimated that ~5.25 trillion pieces of plastics are currently floating around on the ocean’s surface. Previous efforts have found that some marine organisms will mistake plastic pieces for food, which can cause detrimental effects such as a reduction in growth (plastics are not very nutritious). However, there is a lot more to understand about how plastics are affecting life in the ocean. Many plastics contain chemical additives which help the plastic product be more durable – and of course, these additives can also be released from the plastics as plastics are introduced into the ocean. These additives are made from carbon-based molecules, which makes them dissolved organic carbon (DOC). Marine dissolved organic carbon is one of the largest carbon reservoirs in the world and is vital for marine life. Dissolved organic carbon is one of the fuels (aka food sources) that allows microbes to grow. Could it be possible that these chemicals leaching out of plastics could become an available food source for marine microorganisms? This study, carried out by Cristina Romera-Castillo and colleagues, sought to understand how marine plastics affect the very base of the marine food web, which is the foundation for life in the ocean. Specifically, do plastics release ‘edible’ dissolved organic carbon, and thus influence the microbial growth in the ocean? The Methods: Does DOC leach from plastics? Laboratory experiments using four different types of widely used plastics were set-up. These plastics included polyethylene and polypropylene which are among the most commonly found plastics in the ocean and can be used in products such as grocery bags. Experiments where these plastics were immersed in seawater were exposed to solar radiation for either 6 or 30 days, and then the change in dissolved organic carbon from the beginning to the end of the experiment was measured. A control laboratory experiment that was not exposed to sunlight (remaining in the dark) was also tested to assess the role that sunlight played in the leaching as well as if dissolve organic carbon is released whether or not sunlight was present. Additionally, the availability of the leached dissolved organic carbon as a food source, termed bioavailability, was tested using the plastic-leached water after it was exposed to artificial sunlight. The ‘after’ water was combined microbe-abundant water from the North Adriatic Sea and other nutrients were added to make sure growth would only be limited by the bioavailability of dissolved organic carbon. Samples were collected at least daily to measure the bacterial growth until the microbial community reached a stationary phase which is when no more growth was measured. So, do plastics leach dissolved organic carbon? Yes! Romera-Castillo and colleagues estimated that upwards of 23,600 metric tons of dissolved organic carbon could be released into the ocean by plastics each year. In areas with a high density of plastics, this leaching could make up to 10% of the DOC. The majority of dissolved organic carbon is leached from plastics within 5 days of being immersed in seawater – which indicates that the introduction of plastics to the ocean has an immediate effect on the dissolved organic carbon reservoir. Now, is that dissolved organic carbon edible to microbes? Yes! Romera-Castillo and colleagues found that up to 60% of the leached DOC was bioavailable to microbes. Interestingly, the dissolved organic carbon was slightly more bioavailable during the control laboratory experiments kept in the dark, suggesting that exposure to sunlight may slightly decrease the edibleness of the dissolved organic carbon. What does this mean for plastics and the carbon cycle? This study demonstrated that plastics affect marine life, but in a new way. The dissolved organic carbon that leaches off of plastics provides a non-natural food source that can fuel growth marine microbes, which could affect the entire marine food web. Some estimates have predicted that addition of plastic pieces to the ocean will increase by 10% in the next decade, which indicates that dissolved organic carbon inputs will also increase. This study leaves a few unknowns worth exploring. For starters, what happens to that 40% of the dissolved organic carbon that is not bioavailable? Second, this study only looked at dissolved organic carbon leaching from four types of plastics, but there are many other plastic polymers entering our ocean each year! Overall, this study demonstrated that plastics have the ability to influence the base of the marine food web by providing a new carbon food source that can affect microbe growth.